We have just returned from cycling a portage section around the lower gorge on the Orange River near Onseepkans which is just in from Pofadder. It was spectacular to say the least. The “Tri the Beloved Country Expedition” is going very well!. 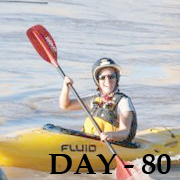 Kim has now run 1016km, mountain biked 2970Km’s and kayaked 180km. She has 440km’s of kayaking left before she reaches the mouth. Once at Alexander Bay she will continue her run along the coast to East London – a whopping 1900km along the beach at a minimum of 42km’s per day. Updates get posted as soon as they arrive. Amazing to think that the long run home is almost upon you – my mind boggles at the mileage you have covered!Well done! Been out of touch the past few weeks- Can’t believe the distance you’ve covered in this time! Absolutely amazing…..Keep on going! Holgat river very appropriate name. Greets to all of you out there!